Global tensions are mounting as the US sanctions against Venezuela’s nationally owned oil & gas company PDVSA continue. Russian Energy Prime Minister told reporters U.S. sanctions are “illegal violating international law”. As the US declared PDVSA as a Specially Designated National. “This means that U.S. citizens are generally prohibited from dealing with them”. 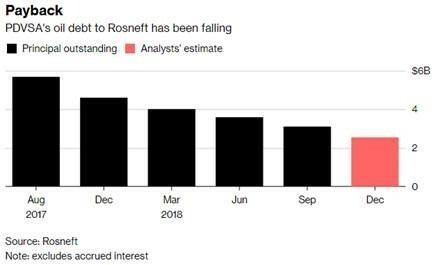 Russia’s Rosneft has billions at risk as Venezuela is one of the company’s largest international investments. This includes foreign companies from doing business with Venezuela using the U.S. Financial system, or US brokers. This will hinder Venezuela’s ability to seek buyer globally. PDVSA will need to replace roughly 500,000 barrels a day that was being sold to the United States. Current exports will be sent to other countries and sold at a lower price. President Trump’s National Security Adviser, John Bolton, is also advising the financial community not to trade in other commodities such as gold to try to put additional pressure on Nicolas Maduro to step down. It has been reported that some European oil traders have also stopped dealings with PDVSA. Venezuela remains one of the top three biggest suppliers of crude behind Canada and Saudi Arabia. Valero Energy, who relies heavily on Venezuelan crude, said it would “re-optimize” supply to minimize the impact of the sanctions. Alternative supplies may cause higher prices. Crude imported from PDVSA is a heavy crude, but easier to mix with lighter oil out of shale basins. Refineries along the Gulf Coast will suffer the most because the sanctions will force them to purchase heavy crude from the Middle East. Oil prices gained an overall 18% increase for the month of January.